Lewes Castle is a ruined Norman Castle. You can climb to the top for stunning panoramic views across Sussex.The adjoining Barbican House is home to the Museum of Sussex Archaeology and houses local collections from the Stone Age to medieval times. Lewes Castle is mainly outside with lots of steps. We wanted to find a way to encourage people to the top of the castle but also to represent the view through a creative use of sound in the garden at the bottom, for those not going up the steps. 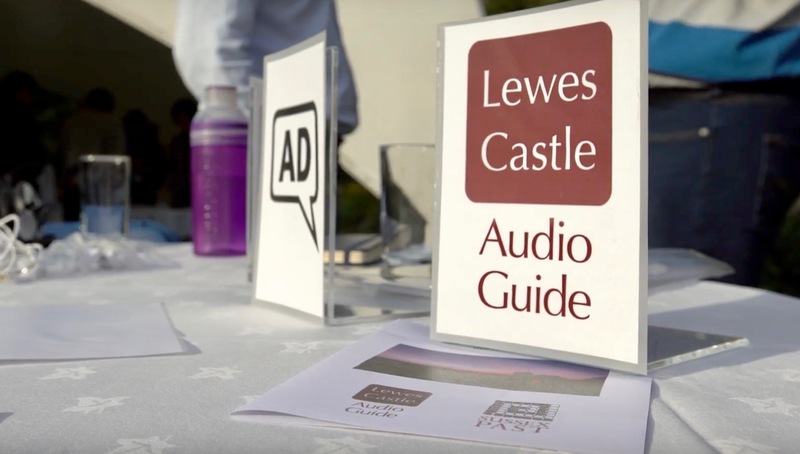 We decided to create an audio guide that would improve access to the buildings and collections for all, as well as provide key orientation and audio described information for blind and partially sighted visitors. Firstly, we worked with an app developer (Echoes)a sound artist, (Joseph Young), an audio describer and castle staff to create a script. This was used by the sound artist to create an audio described journey around the castle using binaural recordings and historic characters. This was turned into an app that uses iBeacon technology, so that the audio is triggered as you pass points around the site. There is also a permanent sound installation and a listening bench in the garden. As the project was technically ambitious and we wanted to incorporate the needs of our visitors, each step of the design process was accompanied by user testing. A focus group made up of blind and partially sighted people talked to us about how they used digital technology and the kinds of features they would like to have built into the app. This meant we could embed accessibility into the design of the app from the beginning. Feedback from focus group participants has been overwhelmingly positive and the audio guide has made a significant impact on the way blind and partially sighted people enjoy their experience of a physically demanding heritage site. The app, whilst designed with blind and partially sighted visitors in mind, is not marketed solely for this purpose, making it a way of accessing the heritage, for everyone.